Tommy Bahama outdoor furniture is renowned for an upscale style that makes easy living look and feel right at home in your outdoor living space. You may know Tommy Bahama for their island-style clothing. We’re introducing you to their upscale savvy line of furniture. The Tres Chic line features a range of furniture, from deep seating like couches and sofas to the featured dining set. The Tres Chic dining set features the signature Tres Chic combination of hand treated teak wood paired with a stainless steel frame that bends and curves with marked visual interest. 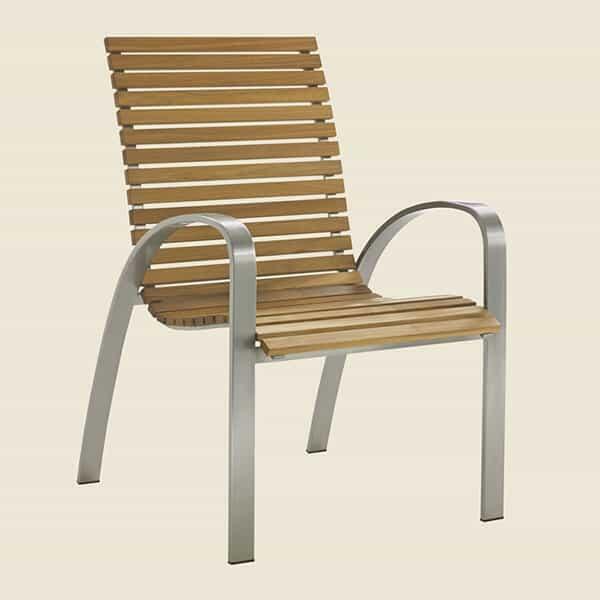 Both the stainless steel and teak components are outdoor-grade materials made specifically for outdoor placement, whether on your patio, under a pergola, on a porch or poolside. Though the featured set shows a round dining table and four dining chairs, a longer rectangular table in the same style is also available. This year, bring the contemporary design of Tommy Bahama to your backyard. Chair Dimensions 24.25" W x 28.5" D x 37.25’?